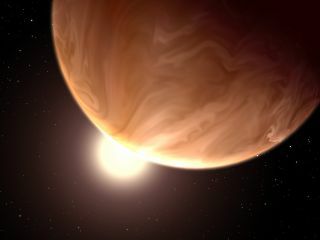 An artist's illustration of the alien planet GJ 1214b, a 'super-Earth' more than six times the mass of Earth that appears to be covered with high clouds, according to Hubble Space Telescope data. Image released Dec. 31, 2013. Scientists have found evidence of extraterrestrial clouds blanketing two of the most common types of planets in our Milky Way galaxy, NASA officials say. Two teams of researchers used the Hubble Space Telescope to characterize the atmospheres of the two exoplanets. One of the alien planets is a so-called "super-Earth" larger than the Earth, while the other has been dubbed a "warm Neptune." Studying both types of worlds can help scientists learn to classify the atmospheres on other Earth-like planets in the future. Knutson is lead author of the study that analyzed the planet GJ 436b, the Neptune-like world orbiting its parent star every 2.64 days. It is classified as a "warm Neptune" because its orbit is closer to its parent star than the distance between Neptune and the sun in our solar system. This artist illustration compares the sizes of exoplanets GJ 436b and GJ 1214b with Earth and Neptune. Hubble Space Telescope observations suggest the exoplanets are blanketed with clouds. Image released Dec. 31, 2013. As GJ 436b and the super-Earth GJ 1214b pass in front of their parent stars, the atmosphere creates a bloated sphere that precedes the body of the planet in the front and follows it in the back. Scientists can study how the light changes to determine the composition of the atmosphere it penetrates. For the Neptune-like GJ 436b, which is located 36 light-years from Earth in the constellation Leo, the results were more about what the researchers didn't find. The light, or spectra, was featureless, revealing no chemical fingerprints in the planet's atmosphere. "Either this planet has a high cloud layer obscuring the view, or it has a cloud-free atmosphere that is deficient in hydrogen, which would make it very unlike Neptune," Knutson said. "Instead of hydrogen, it could have relatively large amounts of heavier molecules such as water vapor, carbon monoxide, and carbon dioxide, which would compress the atmosphere and make it hard for us to detect any chemical signals." In a separate study, a different team of researchers examined GJ 1214b, the first super-Earth to have its atmosphere classified. Located 40 light-years away in the constellation Ophiuchus, the massive rocky planet circles its star 70 times closer than Earth orbits the sun. The distance between the Earth and sun is about 93 million miles (150 million kilometers). Previous studies of GJ-1214b provided similar findings to that of GJ 436b—featureless spectra that lead researchers to conclude the atmosphere could be predominately water vapor or hydrogen. The Hubble Space Telescope allowed the second team, lead by Laura Kreidberg and Jacob Bean—both of the University of Chicago—to obtain a deeper view of the planet's atmosphere, finding what they considered definitive evidence of high clouds shrouding the planet. The encompassing clouds block views of lower cloud layers or the surface. The Hubble revealed no chemical signs in the clouds, but the high-precision instruments allowed the researchers to rule out water vapor, methane, nitrogen, carbon monoxide, or carbon dioxide in the clouds. Models of both planets predict clouds made out of potassium chloride or zinc sulfide, both of which could stand up to the extremely high temperatures predicted to be found in the atmospheres. "You would expect very different kinds of clouds to form on these planets than you would find, say, on Earth," Kreidberg said in the same statement. To obtain these findings, both teams of scientists maximized Hubble's capabilities. "We really pushed the limits of what is possible with Hubble to make this measurement—our work devoted more Hubble time to a single exoplanet than ever before," Kreidberg said. "This advance lays the foundation for characterizing other Earths with similar techniques." The launch of the James Webb Space Telescope at the close of the decade will allow an even more detailed look at distant planets. "The James Webb Space Telescope will be transformative," Kreidberg said. "The new capabilities of this telescope will allow us to peer through the clouds on GJ 1214b and similar exoplanets." The two separate papers were published in the Jan. 2 issue of the journal Nature.